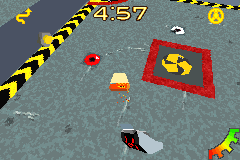 GBA Robot Wars: Extreme Destruction (Europe) "Tournament mode" in 05:20.92 by Shima33. Robot Wars: Extreme Destruction is an action game developed by Warthog Games and published by BBC Multimedia in 2002 for the Game Boy Advance. The player controls a radio-controlled robot which battles it out with other robots in order to win. In this run, Firestorm 3 blatantly bullies the other contestants, finishing every one of its fights in under 10 seconds to clock in a total run time of 5:20.